BACKGROUND The hyperimmunoglobulinaemia D and periodic fever syndrome is a hereditary periodic fever, caused by deficiency of the enzyme mevalonate kinase. It is unclear how this defect leads to recurrent fever episodes. AIM To assess the involvement of cysteinyl leukotrienes in the pathogenesis of fever attacks as reflected by urinary leukotriene E4 (LTE4) excretion. 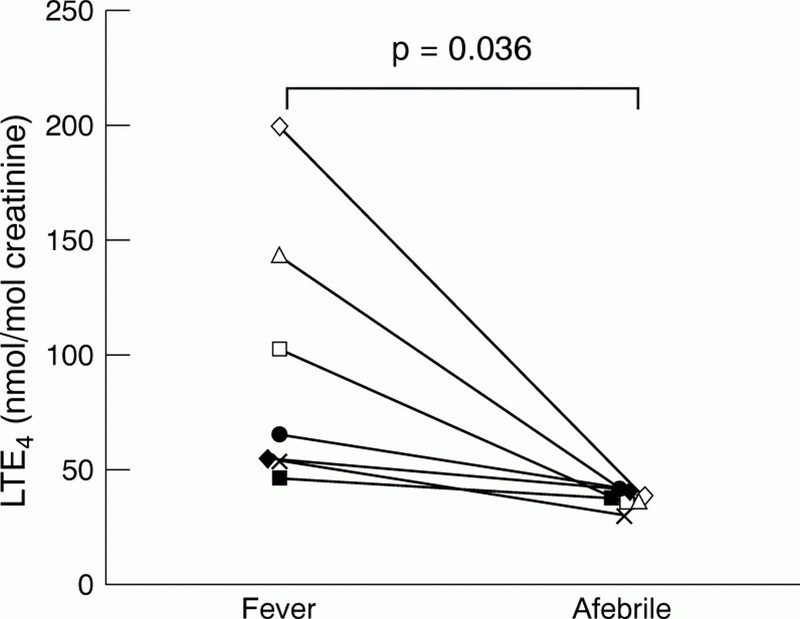 METHODS Urinary LTE4was measured in seven patients while febrile and afebrile. RESULTS LTE4 was raised during fever in all subjects (46–199 nmol/mol creatinine, mean 92; normal <40). Urinary LTE4 was normal between attacks, as well as in normal children with fever as a result of miscellaneous causes. CONCLUSION Our results suggest that cysteinyl leukotrienes play a role in the pathophysiology of this disorder. As no effective treatment is yet available, leukotriene receptor antagonists might offer a new therapeutic approach for patients with the hyperimmunoglobulinaemia D and periodic fever syndrome. Dutch type periodic fever (MIM#260920), also known as the hyperimmunoglobulinaemia D syndrome (HIDS), is an autosomal recessive disorder, characterised by febrile attacks recurring at more or less regular intervals and the presence of an increased serum IgD concentration.1 Temperature typically rises abruptly, remaining continuously increased for three to six days. Febrile episodes recur every two to eight weeks from infancy. During these attacks patients often complain of malaise, chills, headache, arthralgias, nausea, vomiting, diarrhoea, and abdominal pain. The affected children often have striking cervical lymphadenopathy and may have splenomegaly, hepatomegaly, arthritis, and a variety of skin rashes.2 In the patient's blood, markers of inflammation such as white cell counts, erythrocyte sedimentation rate, and serum concentrations of several proinflammatory cytokines, are raised during febrile episodes,3 and the urine concentration of neopterin is acutely raised.4 Mutations in theMVK gene, which encodes mevalonate kinase, have been identified as the underlying genetic defect.5 6These mutations lead to a substantially reduced activity of mevalonate kinase, a key enzyme in the biosynthesis of cholesterol and other isoprenoid compounds. The pathogenesis of inflammation in both MA and HIDS remains unknown. However, in patients with mevalonic aciduria urinary excretion of LTE4 was found to be highly increased,11suggesting a pathogenic role for cysteinyl leukotrienes in MA. In the present study, we tested the hypothesis that cysteinyl leukotrienes are similarly involved in HIDS. After obtaining informed consent, urine samples were collected from seven children (aged 7–13 years), whose diagnosis of HIDS had been confirmed by demonstration of mutations in both copies of theMVK gene. From each case samples were obtained twice, once during a fever episode and once between attacks. Clinically, the fever could be attributed to an attack of HIDS (and not to an intercurrent infectious disease). Samples were collected in polypropylene containers and either immediately frozen and stored at −80°C (cases 1–3) or frozen at −20°C, thawed, transferred to smaller containers, and then stored at −80°C (cases 4–7) until analysis. The presence of pathological constituents was excluded. Mevalonate concentrations were determined with a stable isotope dilution assay and gas chromatography–mass spectroscopy.5Urinary LTE4 was measured as described previously.10 12 Briefly,3H-LTE4 (Du Pont–New England Nuclear, Boston, Massachusetts) was added as an internal standard. All urine samples were then acidified to pH 4.5 by addition of 0.1 mol/l HCl. Extraction of LTE4 was performed on Sep-Pak C18 cartridges (Waters Associates, Milford, Massachusetts); separation of LTE4 from other leukotrienes was carried out by reversed phase high pressure liquid chromatography. Quantification of LTE4 was performed by enzyme immunoassays with specific antibodies (Cayman, Ann Arbor, Michigan). The corresponding specificity for the LTE4 antibody was 100% for LTE4, 10% for LTC4, 9% for LTD4, and <0.01% for LTB4. Statistical analysis was performed using a paired samplest test (SPSS 8.0). Between fever episodes the mean urinary LTE4excretion in HIDS patients was 36 (range 30–40) nmol/mol creatinine, well within the normal limit (<40 nmol/mol creatinine). During fever episodes, urinary excretion of LTE4 increased in all patients (mean 92, range 46–199 nmol/mol creatinine; fig 1). This was significantly higher than the values recorded when patients were afebrile (p = 0.036). As expected in HIDS, the concentrations of mevalonic acid in urine were increased during fever periods. However, there was no correlation between urinary concentration of mevalonic acid (4.2–41.5 mmol/mol creatinine; normal <0.1 mmol/mol creatinine) and that of LTE4 (data not shown). In addition, urinary LTE4 was found to be within normal limits (30.8 (6.5) nmol/mol creatinine) in 20 infants and children with fever caused by viral or bacterial infections as well as fever of unknown origin, recruited from outpatients and inpatients at the University Children's Hospital, Heidelberg, Germany. Urinary LTE4 remained unchanged in the same group of otherwise normal children when afebrile (31.4 (6.3) nmol/mol creatinine). LTE4 concentrations during and between fever episodes. Cysteinyl leukotrienes have a pathophysiological role as mediators of inflammation in disease states like bronchial asthma, juvenile rheumatoid arthritis, or inflammatory bowel disease.13 14 In addition, LTE4 excretion was found to be enhanced in the most severe form of mevalonate kinase deficiency, MA.15 In this disorder and in contrast to HIDS, urinary LTE4 is constantly raised, even though the highest values are found during febrile episodes. In this study, we showed increased excretion of LTE4 in seven patients with the mild form of mevalonate kinase deficiency, HIDS, during fever, but not between attacks. The concentrations of LTE4 during the attacks of cases 4–7 (open symbols in fig1) were lower than those in the clinically equally severe cases 1–3 (closed symbols in fig 1), which in part might reflect the temporary thawing of urine samples in combination with the instability of LTE4. However, independently from the storage procedure, all urine samples from the patients with HIDS showed significantly raised LTE4 concentrations during fever episodes. Although the number of patients is small, our data point to a role of cysteinyl leukotrienes in the pathogenesis of the episodic inflammation in HIDS. While increased LTE4 excretion is not specific for MA or HIDS, it is not merely a consequence of fever, as urinary LTE4 is not raised in children with fever caused by viral or bacterial infections. The introduction of cysteinyl leukotriene receptor antagonists should help to elucidate the role of these mediators in HIDS. It is speculative whether such agents could reduce the severity of fever attacks in HIDS. As these have thus far been resistant to all current anti-inflammatory treatment,2 a future new therapeutic approach would be most welcome. We are indebted to J de Jong, BT Poll-The, M Duran, and W Kuis for their expert help and advice. This study was supported by a grant from the Deutsche Forschungsgemeinschaft, Bonn, Germany, to Dr Mayatepek (Ma1314/2–3). (1984) Hyperimmunoglobulinaemia D and periodic fever: a new syndrome. Lancet 1:1087–1090. (1994) Hyperimmunoglobulinemia D and periodic fever syndrome. The clinical spectrum in a series of 50 patients. International Hyper-IgD Study Group. Medicine (Baltimore) 73:133–144. (1995) Cytokine activation during attacks of the hyperimmunoglobulinemia D and periodic fever syndrome. Blood 85:3586–3593. (1995) Interferon-gamma and urine neopterin in attacks of the hyperimmunoglobulinaemia D and periodic fever syndrome. Eur J Clin Invest 25:683–686. (1999) Mutations in MVK, encoding mevalonate kinase, cause hyperimmunoglobulinaemia D and periodic fever syndrome. Nat Genet 22:175–177. (1999) Mutations in the gene encoding mevalonate kinase cause hyper-IgD and periodic fever syndrome. International Hyper-IgD Study Group. Nat Genet 22:178–181. (1988) Mevalonic aciduria: pathobiochemical effects of mevalonate kinase deficiency on cholesterol metabolism in intact fibroblasts. J Inherit Metab Dis 11 (suppl 2) 229–232. (1993) Clinical and biochemical phenotype in 11 patients with mevalonic aciduria. Pediatrics 91:915–921. (1987) Leukotrienes and lipoxins: structures, biosynthesis, and biological effects. Science 237:1171–1176. (1990) Metabolism of cysteinyl leukotrienes in monkey and man. Eur J Biochem 194:309–315. (1997) Enhanced excretion of urinary LTE4 in mevalonic aciduria is not caused by an impaired peroxisomal degradation of cysteinyl leukotrienes. J Inherit Metab Dis 20:721–722. (1989) Analysis of cysteinyl leukotrienes in human urine: enhanced excretion in patients with liver cirrhosis and hepatorenal syndrome. Eur J Clin Invest 19:53–60. (1990) Leukotrienes and other products of the 5-lipoxygenase pathway. Biochemistry and relation to pathobiology in human diseases. N Engl J Med 323:645–655. (1995) Leukotrienes: biosynthesis, metabolism, and pathophysiologic significance. Pediatr Res 37:1–9. (1993) Enhanced urinary excretion of LTE4 in patients with mevalonate kinase deficiency. J Pediatr 123:96–98.